There are some things you just don’t find out until you try on a wedding dress yourself. 1. Breakfast actually is the most important meal of the day. Starting out “hangry” is like shopping suicide. You probably don’t need to wolf down a burger and fries moments before you step into that slinky gown, but make sure you have something to eat before getting started. Trying on gowns is emotionally and physically draining (some dresses weigh twice as much as a puppy!). You may even sweat a little, so fuel up! 2. Choose your companions wisely. Most bridal salons are happy to welcome you and a few guests (not your entire entourage). This is actually a good thing! There’s only room for a couple extra bodies and all that tulle anyway, and you’ll have fewer people weighing in on your decision. Its great to have trusted opinions, but too many and you’ll be paralyzed with fear of making the wrong choice. 3. Wear a touch more make up than usual. Buying a fancy dress is not an everyday occurrence — it’s going to be a tricky decision no matter what. Not to mention the unflattering florescent lighting typical of most fitting rooms. Do yourself a favor and wear a touch more makeup than your usual look (we’re talking some blush and black eyeliner) to your appointment. You’ll look more like you will on your wedding day, which will ultimately make it easier to pull the trigger on a gown. 4. Be prepared to strip down. Truth: A veritable stranger may catch glimpses of you naked. Most consultants will give you some privacy, but because dresses can be unwieldy or delicate they’ll want to help you in and out of them. Wear undergarments that you don’t mind seeing the light of day (we recommend light-color boy shorts and a strapless bra). If you’re a modest-kind of girl, speak up from the start. She may be older than your Mom or still single, but she wouldn’t be doing this if she wasn’t totally qualified. Your consultant knows the dresses and sees hundreds of brides with varying body shapes try them on every day. Make sure you share your wants (lace, a-line, sleeves) but be open to her suggestions–you may end up with one of her picks when its all said and done. 6. 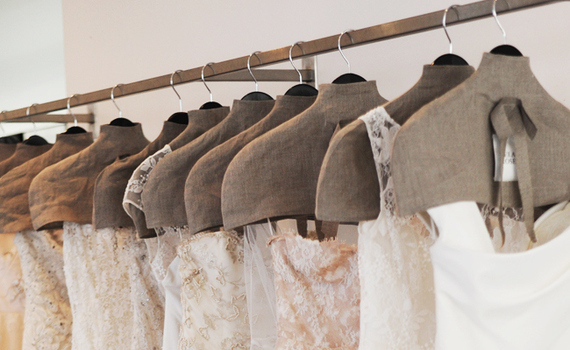 A bridal 8 is not a J.Crew 8. Don’t panic. You do not need to enroll in Bridal Boot Camp — wedding gown sizes are not the same as “street” clothes. If you wear an 8 in your favorite summer dress, there’s a good chance you’ll be wearing a 12 or 14 down the aisle. Focus on how great you feel in the dress, not the number on the tag. Even if you have your heart set on a mermaid lace gown, or think you can’t wear silk, try on a variety of gowns. You’re only going to do this once and you may surprise yourself by choosing something completely different than the pins on your inspiration board. And try the dress that your mother (or grandmother or mother-in-law-to-be) is just sure is “the one” — she’s been looking forward to this day too. She’ll either see that you were right about the skirt swallowing you whole, or you may shock yourself by actually liking the dress — it’s a win-win. 8. Some “other” bride might be wearing “your” dress. Let’s get real: you’re not the only bride planning a June wedding, so its entirely possible someone else will be trying on “your” dream dress. Or, you may see someone wearing an illusion back gown that you hadn’t considered and want to try it on RIGHT. THIS. MINUTE. Play nice — share the mirrors, pedestals and even the gowns. 9. Don’t just stand there, move around! Sure, there will be moments when you’re standing still at your wedding (like when you say I do). But you’ll also be sitting and mingling and getting down on the dance floor. If you think the dress is a serious contender, take a walk around the salon, sit down, practice your “SHOUT!” technique. You may feel foolish in the moment, but you’ll be glad you gave the gown a test drive when you’re comfortable all day and night. 10. You may not cry. Maybe emotion will overcome you. Maybe your Mom will get choked up too. But it’s totally okay if no one cries. It doesn’t mean you picked the wrong gown (even if you’re the first to tear at a sappy commercial). Every bride is different so don’t put pressure on yourself to react a certain way. Also, your consultant may not pop a bottle of champagne (some can’t due to liquor laws) like you see on TV. Take your shopping companions out for a celebratory drink instead — you all deserve it! Bonus: When you’ve found the dress, most salons require you to sign a contract and put down a deposit on the spot. You may have to commit to things like a size and any customizations (adding sleeves, dropping the waist) you and your consultant discussed. Ask about alteration costs, which can add up. And ask if any discounts are available — you’re not going to get half off, but there may be an upcoming trunk show or a special rate for purchasing your bridesmaids dresses at the same salon. Sometimes you’ll get lucky and they’ll throw in a veil — it never hurts to ask!